NACTO-GDCI has developed an educational tool focused on the Streets for Kids (SfK) program, which looks at cities through the lens of children and their caregivers. The SfK team is currently working to produce a design guide that will supplement the Global Street Design Guide. After publication, the team will transition to running workshops and trainings and implementing projects in select cities. Through SfK-focused workshops and “WalkShops”, GDCI encourages designers, planners, city officials, and others to experience city streets from the perspective of a child—literally and figuratively. 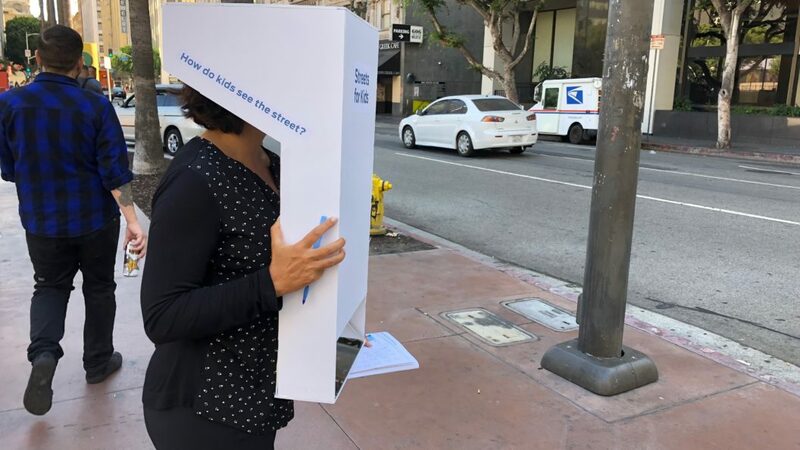 A “reverse periscope” enables adults to see the street as a child does, from the height of about 95 centimeters, and an observation-focused workbook guides a walk through local city streets. This city walk encourages participants to look at myriad streetscape infrastructure as it relates to kids and their caregivers, like obstacles on the sidewalk, accessibility issues, time required to cross the street, noise levels, and air quality. GDCI debuted this WalkShop tool during the Bernard van Leer Foundation’s annual meeting in Los Angeles in late September, and used this again at Walk21, a walkable cities conference in Bogotá, Colombia, in mid-October. “This was a great exercise because actual walk audits are so important. We need to consider the real, lived experience, and to discuss solutions to design challenges,” noted one participant. The team will continue to refine interactive WalkShop tools based on these experiences and with influence from ongoing research and design guide production. 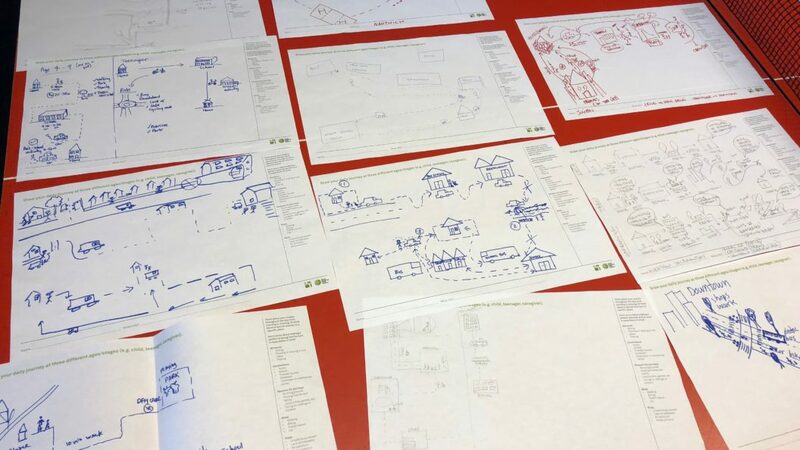 Sketching daily journeys and routines based on participants’ experience as children, teenagers, or caregivers. 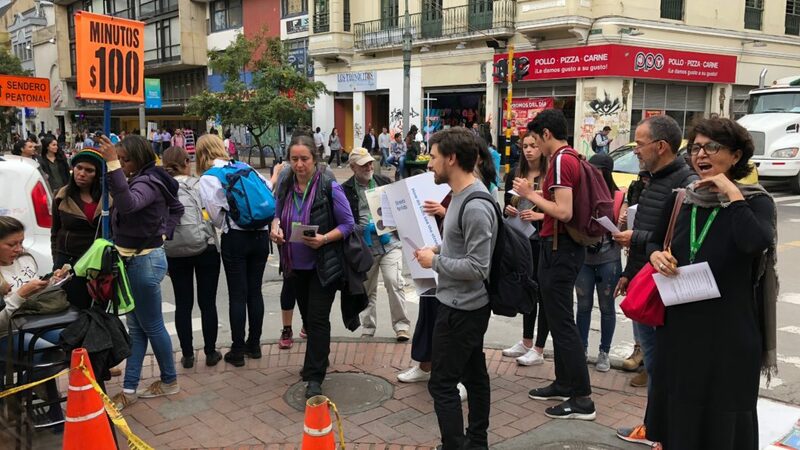 Introducing a Streets for Kids WalkShop in Bogotá, Colombia, where participants looked at different street typologies for safety, comfort, and inspiration. A Streets for Kids WalkShop in Los Angeles uses a reverse periscope to see the street from a child’s eye level.